At the graduate convocation ceremonies that was held today in the Ernest Cormier Amphitheatre of the Université de Montréal, HEC Montréal paid tribute to Pierre Brunet, corporate director and Chair of the Board of Montréal International, awarding him an honorary doctorate conferred by the Université de Montréal at the School’s recommendation. The honorary degree was presented to Mr. Brunet before the graduation ceremony for students who have completed the Master of Science in Administration, Master of Laws, taxation option, Master of Science in Electronic Commerce, MBA in Action and Intensive MBA programs. This year, HEC Montréal awarded some 475 graduate degrees. 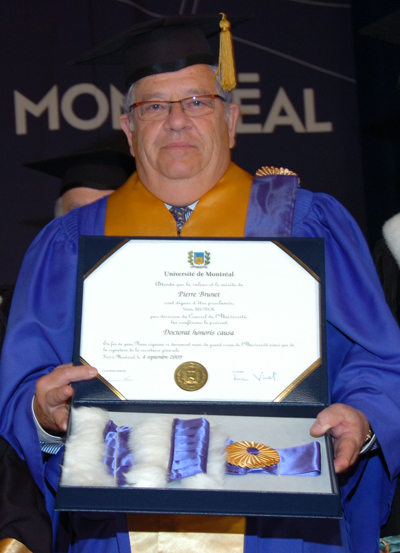 Mr. Brunet graduated from HEC Montréal in 1964, and has had a long and distinguished career in accounting and brokerage firms and in the banking field, in particular as President and CEO of National Bank Financial. In recent decades, he has devoted his time to various social, cultural and educational associations, and sits on several boards of directors. The federal and provincial governments have also drawn on his expertise, appointing him a member of the Wise Persons’ Committee to review the structure of securities regulation in Canada and Chair of the task force on the role of the Quebec government in venture capital. From April 2005 to March 2009, he was Chair of the Board of the Caisse de dépôt et placement du Québec.